HEY, wanna help out the comic, if you could take a moment and VOTE for me here that would be fantastic! 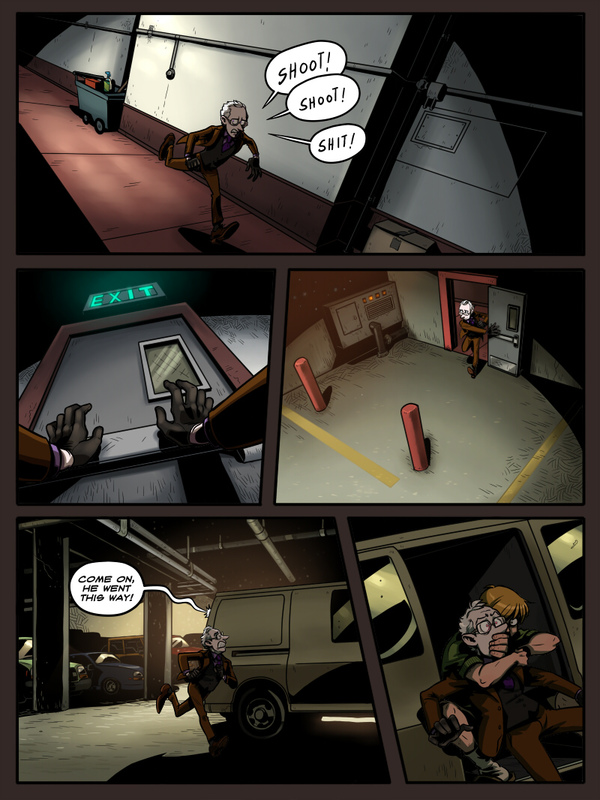 For your trouble you’ll receive a not TOO spoilery peek at a future page containing Phineas’s lack of personal space. Watch out I’m gonna be doing this a ton from now on! Wonderful viewpoints as always. I’m getting used to the varied expressions here, but I still see Doc’s face on panel 4 as him wearing a hastily acquired false moustache disguise. What bared teeth? Why did you say that!? Now I keep seeing it everywhere, and it keeps growing! He’d look great with a bushy stache like that, too. god schtein you are such a damsel in distress sometimes! You surprise me you must spend so much time on back grounds Grundy! Princess Schtein constantly needs some rescuing. You know this page took me less time to draw than I thought it would. That seems to happen sometimes. The crowd scene in the previous page took far longer. Pretty weird. Third panel looks like security camera POV, which seems appropriate. Gorgeous, too. I like to imagine that Phineas had just parked his rapevan(TM) and was about to get out when HE’S RIGHT HERE WHAT LUCK! Is that Phineas? I don’t see his scars. Also, he never struck me as a socks and house slippers kind of guy. He was just sitting in his van for days parking it in random locations waiting for him to finally walk in front of the door. I hope Phineas isn’t planning to take action on what he said about Schtein’s eyes that last time they had an in-depth conversation. I am very confused. Why are his eyes red again? PICK A COLOR! Nah I think they’ll be green on the next page.